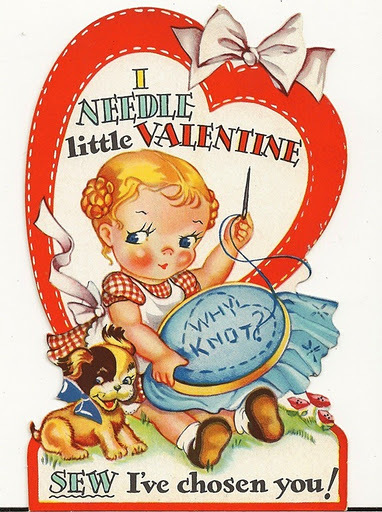 Sewn With Grace: Happy Valentines Day! I hope your day is filled with sweet surprises! That's the cutest Valentine ever! Sew cute! Happy Valentine's Day to you, too. p.s. I won Beverly's Valentine surprise package at My Sew Sweet Studio. My first ever bloggy giveaway. Sooo fun! Renee, Happy valentines day to you as well!! Thanks for being such a nice and encouraging blogger!! That's such an adorable Valentine. I hope your day is full of sweet Valentine blessings, my friend. Oh...This is so sweet...and, so are you each time you bless us with a darling post! Such a cute card and sew perfect for you. Wishing you a Happy Valentine's Day too. Happy valentines day to you as well. What a cute little valentine.